This review first appeared in the January 24, 1998 issue of the American Reporter. It is a landscape so startlingly stark that it helps define our national consciousness. Four Corners country, smack in the heart of the Southwest deserts. Land of the Hopi and Navajo. Of wind-carved landscapes that punify us with their grandeur. It is a landscape that defies adequate description. John Ford tried to do so with the sweep of cinema. Ansel Adams attempted it through the simple elegance of photography. Edward Abbey may have come closest of any of them using mere words on paper. It is a landscape that defied them all, though, one whose surreal magnificence mocks our efforts to capture it for ourselves. But as Camus once wrote about James Joyce's "Ulysses," it is not the result which has meaning but the effort. 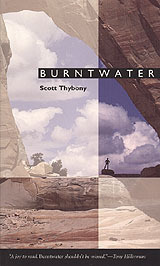 And in that vein, Scott Thybony's modest book of essays on the Four Corners country, "Burntwater," should earn a place with the above sketches of the Southwest. Thybony succeeds precisely because of his humility. He limits himself to compact descriptions of his own interactions with that country. "Only later did I learn about the Navajo idea of beauty and how it moves through life like a wind. It's not the beauty of surfaces alone, but an indwelling beauty that enfolds and completes, a life-restoring beauty. Only later did I learn about beauty and how it can be lost." "'Sometimes,' Milzer says, glancing at a sign, 'a little disorientation is what you need to appreciate this place.'" "Time slows, becoming more tangible, almost solid. In rain country the organic cycle of growth and decay shapes the sense of duration. But here in the arid West it's different. Time is more geologic than biologic. It accumulates, layer upon layer, incrementally slow until all at once the pattern reverses. A tremendous rock slab suddenly unhinges, crashing from a cliff face; a flash flood rushes down an arroyo without warning. Ripping through the strata, erosion lays open the past, exposing the raw edges of history." Thybony's sparse writing style is reflective of the landscape of which he writes; it is this style more than his descriptive prowess that is most effective at conveying a sense of those lands. It is this style that leaves the reader feeling as if he has just returned from the Four Corners himself.